Many critics have been awaiting the EPA fuel-economy estimates for the Chevrolet Volt. Many enthusiasts believed it would be some type of chart fuel-economy sticker that the Volt would receive due to its complex nature of allowing fully-electric driving under 35 miles but over that it would start utilizing the gas engine as generator for the battery. They were partly correct, the new EPA fuel-economy sticker for the Chevy Volt is nothing short of a spreadsheet of data explaining the ‘equivalent’ consumption to expect under electric range and then under a miles-per-gallon equivalent. The key figure under the expected 35 miles of electric range is a 93 miles per-gallon equivalent and a 60 miles per-gallon under gas-electric power. If you are still confused, don’t worry, I am still trying to piece this puzzle together myself. The EPA previously released estimates for the Nissan Leaf. 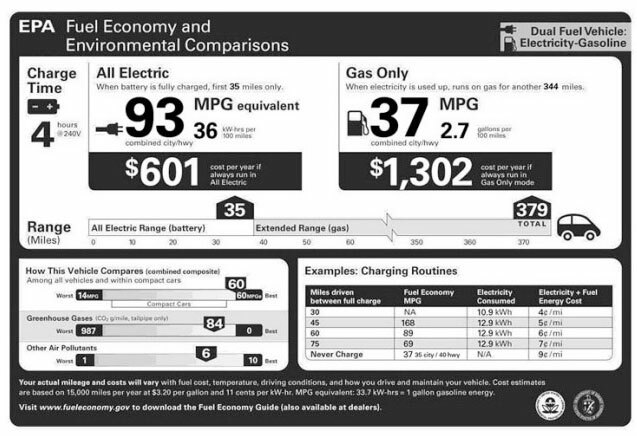 With the Nissan Leaf being an actual EV vehicle that does not require a drop of gasoline, the EPA manages to give the consumer yet another type of equivalent mpg figure being that of 99mpg. Basically this figure tells the consumer they will be consuming the amount of energy/money it takes for a gas powered vehicle that gets 99 miles to the gallon. Hypothetically speaking, if you had a car that got 99 miles to the gallon, you would spend roughly the same amount on gas for that vehicle as you do with the Leaf with consumed electricity when it is plugged in. This is the way it also works with the Chevy Volt only it is a two-fold scenario due to the Chevy Volt actually being able to consume gas in addition to traveling up to 35 miles solely on electric power. You will ‘consume’ energy and rack up a larger power bill when the Volt is plugged in to charge just like the Leaf. Check out the charts and press releases below to see if you understand this situation any better than me. DETROIT – When the 2011 Volt begins arriving in Chevrolet showrooms over the next few weeks it will have an all-new fuel economy label to go with its unique propulsion system. With its ability to operate completely gasoline- and emissions-free for 25 to 50 miles and then continue indefinitely with its range- extending engine, the Volt’s energy efficiency depends on how you use it. Because the Volt works like no other car before it, General Motors and the U.S. Environmental Protection Agency collaborated to design a new label to help consumers understand what to expect when they drive the Volt. Before plug-in cars like the Volt, calculating fuel economy was simply a matter of filling the tank with fuel, driving the vehicle and dividing the distance by the amount of fuel consumed. Even though they have no tailpipe emissions, electric cars still use energy so the MPG equivalent (MPGe) is determined by measuring electricity use and converting it based on the energy content in a gallon of gasoline. This MPGe rating allows consumers to compare the Volt’s efficiency to other cars in its segment. The Volt uses two energy sources, electricity from the grid, and gasoline from the pump, with the mix depending on how far you drive and how often you charge the battery. 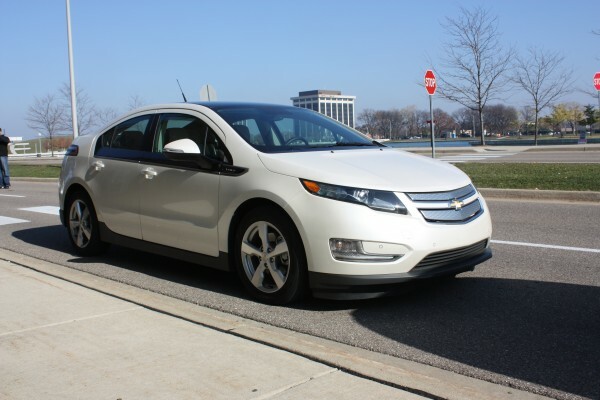 The Volt is a complex vehicle that is incredibly easy to use. 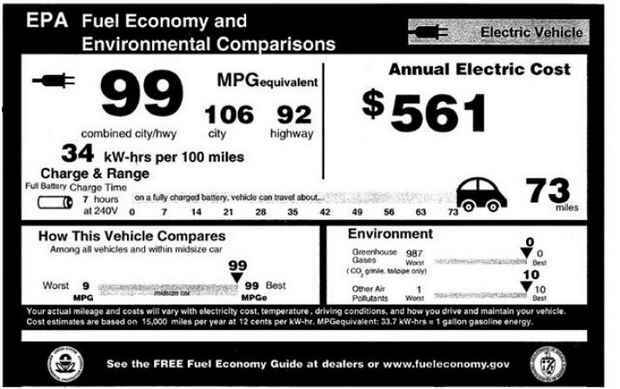 And while the new fuel economy label also looks complex, it has more information than any EPA label before it. FRANKLIN, Tenn., Nov. 22, 2010 /PRNewswire/ — The Environmental Protection Agency (EPA) has approved its fuel-economy label for the 100-percent electric Nissan LEAF, rating the vehicle to be “best” in the midsize vehicle class for fuel efficiency and “best” for the environment. The new label shows a best-in-class 99 miles-per-gallon (MPG) equivalent (combined city/highway). The MPG equivalency rating was developed by the EPA as a way to provide a standard so consumers can compare vehicles across the spectrum and make an educated purchase. In North America, Nissan’s operations include automotive styling, engineering, consumer and corporate financing, sales and marketing, distribution and manufacturing. Nissan is dedicated to improving the environment under the Nissan Green Program 2010 and has been recognized as a 2010 ENERGY STAR® Partner of the Year by the U.S. Environmental Protection Agency. More information on Nissan in North America, the Nissan LEAF and zero emissions can be found at www.nissanusa.com.